Our spacious 2BR/3BA Professionally Decorated Colorado Vacation Rental. Treat your family to a mountain home with 1600 square feet of townhome living space, 2 large decks with grill and Mountain Views, Heated Private Double Car Garage, Stone Fireplace, Breakfast bar, separate Dining Room,and Lodge Pole Pine Motif. 2 blocks to Grocery, Restaurants,Cinema and Shopping. Catch the Free shuttle to 4 major Ski Areas. Complimentary Hi speed wi-fi. Flat screen TV. DVD player. Childrens toy chest and table games. Enjoy the large entree with lots of storage so no one needs to carry equipment up any stairs. This mountain get-a-way is our vacation home and is maintained with a home away from home ambiance rather than a rental atmosphere. 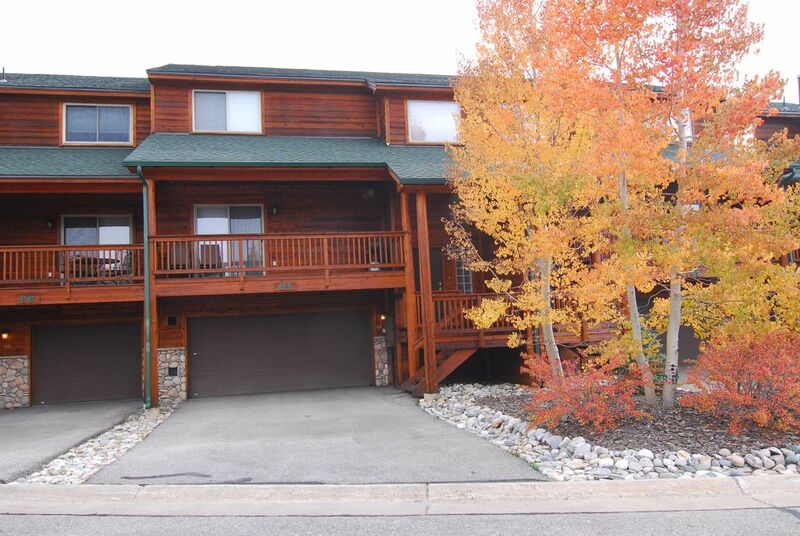 Complex is located on a hilltop overlooking Dillon Reservoir and 3 Mountain Ranges. Two Master bedrooms; each with a Private Bath, Pillow top Queen Bed and full dresser. Large Stone Fireplace and Kitchen Bar invite you to be our guest. Our home sleeps five comfortably with a queen sleeper and Third Bath on the Main Floor plus new HE washer/dryer in the unit. The designer kitchen provide all the Appliances, Granite Counter tops, Henkel Knives, Oneida flatware and storage space you need for a worry free vacation. Indoor hot tub complex is only steps away. Dillon is in the center of Ski Country USA- Summit County Colorado. No other location can give you four major ski resorts, Keystone, Arapahoe Basin, Breckenridge and Copper Mountain within 5-15 minutes by car or free ski shuttle. A short walk leads you to local restaurants, shopping, grocery,8 screen cinema, and three outlet shopping centers. Golfing Resorts are minutes from our front door as are National Forest Access, Lake Dillon and 130 miles of biking trails. You will love Colorado any time of year. We will gladly share our favorite hiking or biking trails, rafting companies, hot-air ballooning trips, snowmobiling trails, cross-country trailheads, elk meadows, or fishing tips with you. This comfortable condominium is well appointed, with a fully equipped open kitchen, washer/dryer, 36' wide-screen TV, Digital Cable with HD and DVR, high-speed wireless internet , and two car heated garage. The views from within the unit and on the balcony are breathtaking. Sailboat, powerboat and kayak rentals are available at the marina. Bicycle rentals are two blocks away, and the full range of all-season Summit County activities are nearby. Dillon is a paradise all four seasons of the year. This is for one of the most spacious floor plans in the area and the best value in Summit County. This is our mountain home as we live in Golden Colorado, just 45 minutes away. Dillon and Summit County have been our play ground for 35 years. We will gladly share our favorite hiking, biking and fishing spots with you. We are the original owners of this home and look forward to any time we can stay in Dillon. With nightly events all summer long, proximity to shopping, lake activities, biking trails,and hiking trail heads, Dillon invites everyone to enjoy our Colorado Rockies. Enjoy your stay in the mountains in our home-away from home ambiance. Our entire home is professionally decorated, very clean and expertly appointed from custom drapes to Henkel Knives. Decorated with comfort, visual appeal and spacious living in mind!!! Walk to the nearby shopping complex with Starbucks, REI sports, Borders Books, City Market, Summit Cinema, Ruby Tuesday, Bank One, Red Mountain Cantina, Sushi Bar, Dillon Liquor, Smash Burger, Walgreens, and Blockbuster Video to name a few. The free shuttle bus can be caught within a short walk from our home with service to 4 major ski areas. Several ski rental locations with superior customer service and knowledgeable assistance are close by. Their hours of operation will accommodate your needs and equipment offerings are extensive. Walk a couple blocks to the Dillon Amphitheatre for free Saturday night concerts all summer long or take out a rented Catamaran from the Dillon Marina just around the corner. Into cycling- rent a tandem bike from several rental shops with 2 blocks of home. Need to work out, try the Silverthorne Recreation Center with indoor track, 6 lane pool, Indoor and outdoor hot tubs, basketball courts, indoor running track, weight room and climbing wall- all only 5 minutes away. We also have a hot tub complex on site with security locks and camera. Dillon is a great place to play hard and relax completely!!! 5 minutes to Keystone resort. Walk to Dillon shopping and outlets in Frisco. grocery on 2 minute walk. 5 major ski resorts within 20 minute drive, free bus shuttle. Open spaces and neighborhood area. Not crammed into a hotel room, nor on top of another townhome. Enjoy open view of Dillon reservoir from all west facing windows. Ceiling fans in upstairsmaster bedroom to move cool evening air throughout our home. In floor radiant heat. Will not dry your skin and very quiet. Also a room humidifier. Located on main floor of our home. New HE washer and dryer on the main living area of our home. New HE front loading Washer and dryer located on main floor of our home. Heated Double Car Garage with lots of storage for skis, boards, bikes. Your gear will be warm and dry the next day. Stored in treasure chest in living area. Includes many games, movies, table games. cards. Chest with games and videos. 1000's of discount rentals available 2 blocks away. (2) Two decks. One on the east side for morning coffee and the other facing west for afternoon sun. Mt/lake views from both. Many resort courses in Sumitt County. Dual hot tub just a few feet way. Indoor with changing room. Spacious and comfortable. Heated garage was nice & convenient. Fireplace added warmth & comfort. Loved the 2 hot tubs near by which were a very good hot temp and helped the store muscles recover. Access was easy with either garage opener or keypad code. Nice kitchen, with dining area, 2 bedrooms, & 3 bathrooms. Owners were responsive to inquiries. Close to supermarket & liquor store, as well as restaurants. Perfect for access to 4 close ski areas. Enjoyed our stay & would recommend. Thank you for such an accurate review of our mountain home. Yes, the heated two car garage is a special feature many rental units in Summit County do not offer. The garage allows one to enjoy a warm car every morning without the need to shovel snow off the vehicles and dry boots, boards and skis each day. A secure location for all your outdoor items is highly appreciated by all our guests. The two hot tubs near by are clean and seldom used due to the small number of rental units in the complex. Allows a rather private use of the tubs. Thanks again for choosing our mountain home for your stay in Colorado. I decided to do a last minute trip to Summit County with my two sons for some end of season skiing. We came across Janet and Bob's home and booked it about six days before departing. All I can say is that their home was perfect for us in every way. Great location, everything was (or seemed to be) new, and very well appointed. To be honest, it was really overkill for what we needed, but so be it! I kind of felt guilty that my wife and daughter could not join us, as they would have really enjoyed it, but since they don't ski, it didn't make sense for them to come. However, I plan to return in the summer and bring them along for everything Summit County has to offer. We really enjoyed our stay at the Dillon townhome. Janet was very thorough by providing any info that we might need during our stay. I especially appreciate having a well-stocked kitchen to prepare meals. The bedrooms were very spacious and comfortable. We also appreciated having a garage for our car. Overall, this was an ideal accommodation for our long weekend of skiing. We have stayed at several different condos in the Dillon area, and this is by far our favorite. It is clean and well maintained. The heated garage is great, you ski gear has a chance to defrost and not make a mess of the interior. There is a washer and dryer which is nice for being able to wash your clothing before you leave. The main level has the living room, kitchen and dining room plus a guest bath and feels very spacious. We never felt like we were on top of the other guests. Each bedroom has their own private bath. There is a grocery store in walking distance (on nicer days) and activities in downtown Dillon are within a 2-3 minute drive. We have stayed here twice now and have always received great customer service. I highly recommend this townhome. Thank you for your comments regarding how spacious, clean and well maintained our mountain home feels. The heated two car garage is a special feature so many units in Summit County do not offer and so often visitors forget to ask about until they arrive and find outside parking. A warm, dry car and dry warm storage for skis and boards is a nice addition. Boots stored in the large lower entrée also provide warm dry storage without hauling items upstairs. 1600 sq. feet of living space allows a home away from home experience. Add a professional décor and you too will return year after year like so many of our guests. Well maintained and supplied condo in a convenient location. Thank you for choosing our mountain home for your winter stay. Others have indicated they love for our unit also with the following comment in our guest book. My husband and I and two kids stayed at the lovely accommodations. We absolutely loved it and commented daily on how lucky we were to find this jewel! Beautiful condo set in a winter fun place! We were close to the slopes during the day but tucked away to ourselves in the evenings. We felt like the only people in the area. The condo had so much to make us feel at home! We can easily see this as our go-to place year after year! Thank you for your generosity! Janet & Bob were wonderful to accommodate us with any needs or questions we had. The town home was very fresh, like new and of high quality and well maintained. We skied four different areas and the farthest was 40 minutes away at Beaver Creek. Thank you for your kind words. We provide a very clean and updated townhome. This is our mountain home, not a management rental unit. Therefore we can provide high quality accommodations, like new furnishings, professional décor, and superior kitchen supplies. Many quests return year after year due to the highly maintained unit we provide, reasonable rates, and proximity to all the area ski resorts. New recreation facility in Silverthorne just 4 miles away. climbing wall, track, pool, weight rooms. Three outlet shopping areas just blocks away. Shop till you drop for sure!